Starkey was the first company to introduce the in-canal hearing aid and the first custom, fully programmable invisible hearing aid. Starkey works with the Starkey Hearing Research Center in Berkeley to compile data and feedback to further the development of their hearing technologies. Starkey’s innovation has been well-recognized with a SXSW Innovation Award in 2017 for the Halo 2; a Silver Edison Award in 2015 for the Halo Made for iPhone hearing aid, and previous awards for SoundLens, AMP, and Xino Tinnitus products. Halo 2 is a Made for iPhone hearing aid that connects to iPhones (and Androids!) 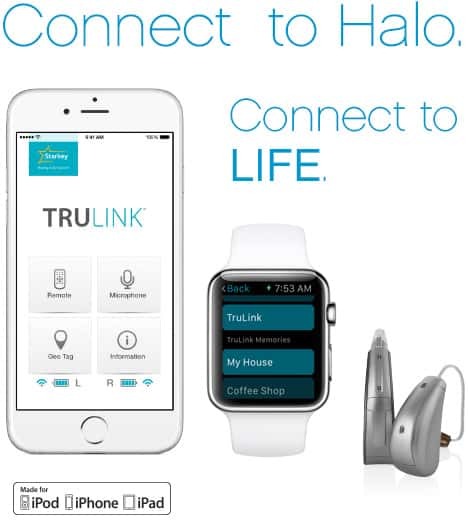 through the Starkey TruLink Hearing Control app. This connection allows wearers to stream phone calls, FaceTime, music, movies, and other media directly to their ears. Additionally, TruLink utilizes the phone’s GPS function to geo-tag your location and archive your preferences. When you return to these locations, Halo 2 will make automatic adjustments, ensuring a positively seamless listening experience. TruLink provides an added boost for people who might need extra amplification in noisy situations. By activating your phone’s microphone, TruLink picks up sound from the source and streams amplified sounds directly to your ears. TruLink’s simple controls allow wearers to make adjustments on their phones without drawing attention to their aids – a level of discretion that wearers appreciate. TruLink’s SoundSpace and Noise Manager features allow wearers heightened personalization of their listening experience. Starkey’s Halo series – both the original Halo and Halo 2 – have been recipients of many industry awards. With the many features available in the second-generation Halo 2, it’s not surprising to see why! Acuity Directionality helps wearers hear better in challenging noise environments by adjusting strategically placed microphones to focus on the sounds in your environment and synchronize the audio data to deliver clear sound. This is especially useful when it comes to speech recognition, often a difficulty with hearing loss. Acuity Directionality, along with Speech Shift, focuses on speech signals for all directions. Halo 2 provides wearers with a comfortable and natural listening experience with feedback and noise reduction features, eliminating whistling and buzzing sounds. Halo 2 is also equipped with Multiflex Tinnitus Technology, to relieve the symptoms of tinnitus. Starkey’s Halo 2 is fully customizable and is available eight colors, in receiver-in-canal (RIC) and behind-the-ear (BTE) styles. Starkey’s Muse Made for Life hearing aids are designed to help you hear all the subtleties of life. Muse hearing aids are designed to process multiple sounds simultaneously, providing wearers with sound clarity and comfort in noise, high-quality music listening, improved speech recognition, and an ultra-high definition audio experience for every situation. With speech recognition as one of the greatest challenges for those with hearing loss, Muse hearing aids feature Acuity Directionality and Speech Shift, both of which protect speech in challenging noise environments. As a wireless hearing aid, Muse connects wirelessly to smartphones, and through the SurfLink app, Muse streams phone calls, music, and other media from your smartphones to your ears. Starkey has designed Muse hearing aids to anticipate and adapt to new sounds, with faster transition speed between sounds. For musicians and music lovers, Muse is equipped with a music memory function to facilitate a high-definition, refined listening experience. Muse also offers a sound comfort technology that eliminates sound distortion and provides a natural experience. For people who experience tinnitus, Multiflex Tinnitus Technology provides an extra layer of comfortable listening. Muse hearing aids are available in a number of standard and customizable styles: completely-in-canal, in-the-canal, in-the-ear, receiver-in-canal, and behind-the-ear. Muse models include a micro receiver-in-canal style, equipped with a telecoil, and a small, slim mini behind-the-ear model. 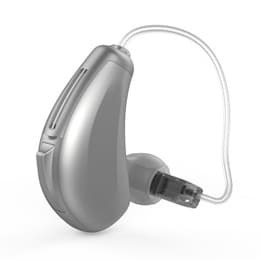 Starkey’s Z Series hearing aids provide wearers a natural listening experience, with emphasis on speech recognition, especially in noisy environments. Like the above Starkey models, Z Series hearing aids connect wirelessly to smartphones through the SurfLink app. Through the SurfLink app, Z Series hearing aids connect wirelessly to smartphones, streaming phone calls, music, and media directly to wearers’ ears. Z Series also is equipped with a Self-Learning feature, which enables them to memorize wearer preferences and make automatic adjustments from one environment to the next. Z Series hearing aids offer features such as binaural spatial mapping, Voice IQ2 (to help with speech recognition), and Multiflex Tinnitus Technology. Z Series hearing aids are available in behind-the-ear, in-the-ear, receiver-in-canal, completely-in-canal, and invisible-in-canal styles.